The Jerusalem Friedensmal consists of the Circle of Peace, framed by a Garden of Freedom with the Border Stone (Inscription: Yerushalayim) on its outer border. The Circle of Peace is dedicated to the inner path and thus to a peace, which one can carry with his speech and action outward into the world. In the middle of the Circle of Peace there's the Rose of Shalom. In its bloom is inscribed the word "Chai", Hebrew for living. 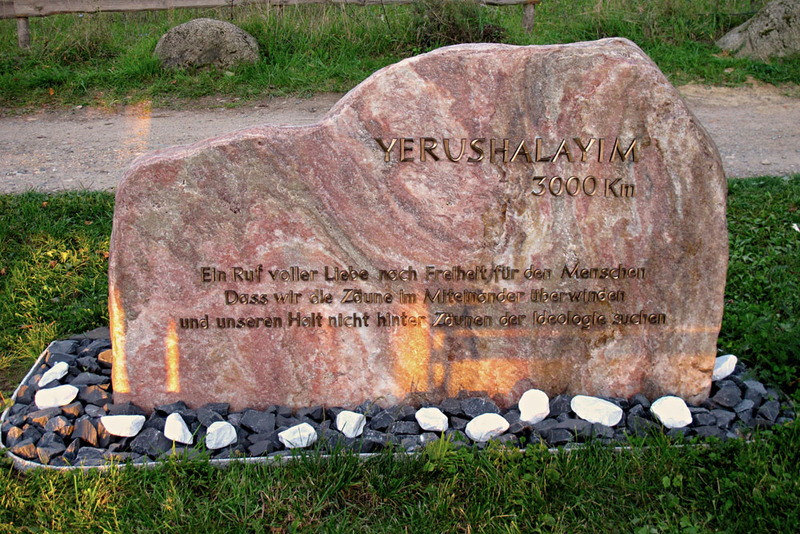 The Jerusalem Friedensmal in Bensheim, 33 miles south of Frankfurt on Main, is a call for peace, freedom and new life. The idea for the Friedensmal was presented to the public in the year 1999 with a book on the Berlin Memorial debate. This idea developed into an artistic response to Peter Eisenman's Holocaust memorial, realized in Berlin in the year 2005. He named the field of stelae he constructed "Terror of Loneliness". It consists of 2711 stelae cast in concrete, symbolizing solidification. 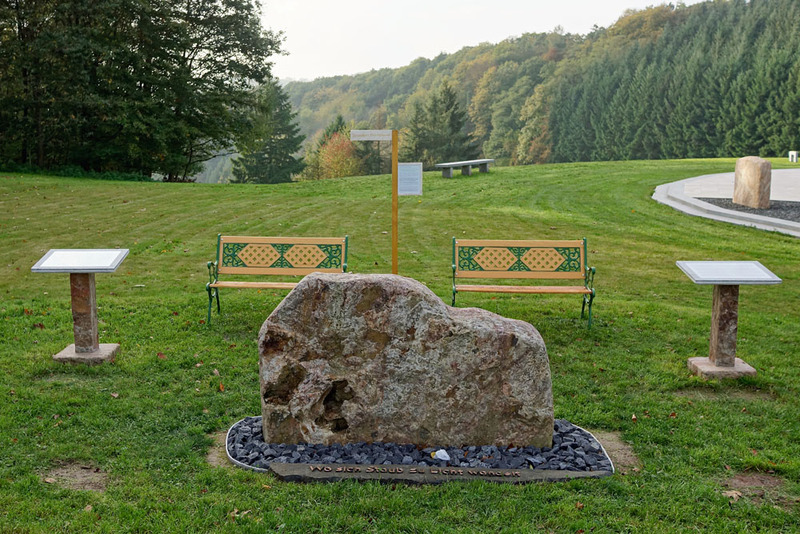 The Friedensmal shows in the awareness of past suffering a path of healing and new life. - Can we not let the past rest? Who does it help to look at the pain and to talk about it? But turning the page on the past and denying the wounds, would only be self-deception. Steps to peace, resulting in the closing of the wounds, are possible and it means to have learned something from the past. Scars remain in the collective memory. Here a message of peace becomes tangible in the outer world. From the Rose of Shalom in the middle of the monument you can look into the German Rhine plain, where the Jewish "Jerusalem on the Rhine" had once been. The message of peace means the healing of the hurt root "Jerusalem", an essential root of German and Western culture. 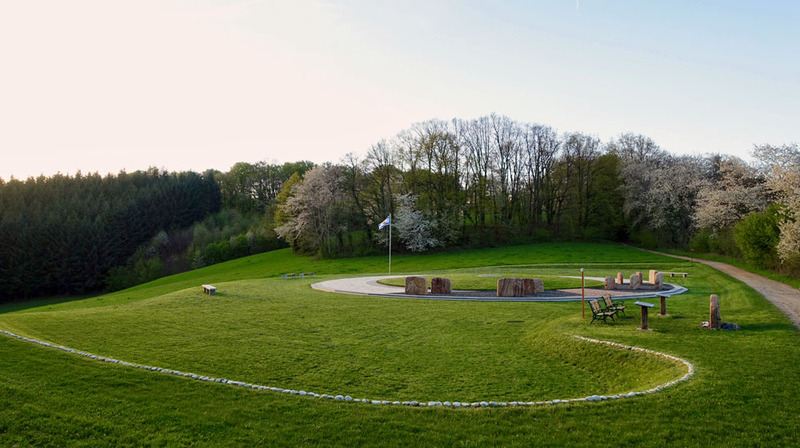 The Jerusalem Friedensmal was inaugurated on September 27, 2015 in Bensheim, Germany. 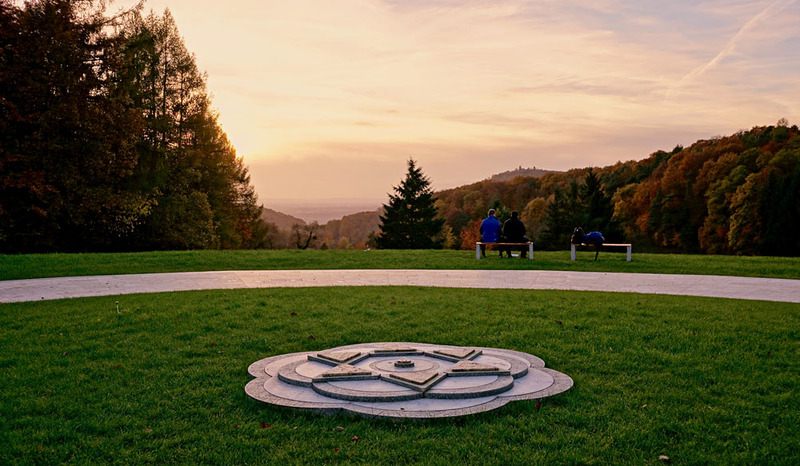 Friedensmal, the German name of the monument is associated with a circular design around which people can gather in a Circle of Peace. Therein lies the idea of community and life. Art shall give society an impulse. It's about the restoration of relationships. This idea is already included in the English name of the central element of the site: Circle of Peace. A Garden of Freedom gives the space in which the Jerusalem Friedensmal can take place. It's about the space we create together to make it happen. This space is a call for freedom, peace and new life. 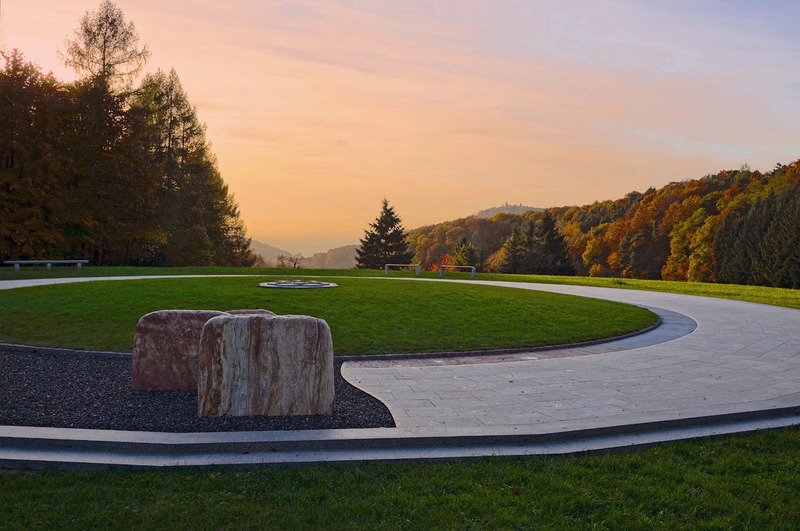 With its two "angel wings" a Garden of Freedom is framing the 26 meters large Circle of Peace. At the border to the European hiking trail No. 8 (the way through the world) there is the Border Stone with the inscription Yerushalayim on the "side of hope". On its other side suffering, both past and current, is addressed. Below it a slate stone in the ground with the inscription „Where dust is turned to light” is pointing in the direction of the Circle of Peace. Garden of Freedom - Here you will find an overall view of the Garden of Freedom as well as an explanation of the individual elements in it with short philosophical texts. This chapter serves as a solid foundation for understanding the project. When rounding the Circle of Peace, you arrive at the same spot again and again. You circle around yourself until you finally stop and walk into the inner to the Tree of Life. For that, you have to walk over the two encircling steps, the Threshold of Humility with the inscription „Recognize the Holy in your midst”. In the picture you look straight on the Tree of Life as a relief in the monument circle. 11 large stones in the "dark ring" symbolize the blockades and entanglements that stand on man's way to himself between him and his freedom. It is the mind of the traumatized person. Unfree people are identified with their entanglements and this is exactly the reason, why the world can be in a state as it is today. The liberation from the entanglements is symbolized by the Tree of Life within the Circle of Peace. The 12th stone, the Border Stone, stands outside the monument circle by the European hiking trail. It represents a responsibility for freedom and peace in the external world. It is „…a call full of love for the freedom of man” (inscription). Circle of Peace - A detailed description of its symbolism is provided here. This is the 12th stone, the Border Stone. We look at the past, remember who we truly are, and confront the present. Life happens in the present: Where do we experience war and restriction instead of peace and freedom today, in our own lives? Where can we assume responsibility for a more beautiful world? Where does our responsibility begin? A threshold of slate underneath the Border Stone refers to the Circle of Peace located to the right of it, with the inscription „Where dust is turned to light”. It shows visitors the way to the path inwards. It signifies a peace that can be found in oneself and which one will carry outwards into the world. Local Past - The 12 years of Nazi rule, a collapse of civilization in the end, is a wake up call for a life in freedom; beyond the borders of an ideological prison. Inscription: „Yerushalayim - A call full of love for freedom for man. That we succeed in overcoming the (inner) fences in our dealings with one another and do not seek to find our inner stability behind fences of ideology.” YERUSHALAYIM – the root "Jerusalem", reaches beyond Christianity into the origins of Judaism. It is a root of our European culture, that has been deeply wounded. Behind the Border Stone there is a fence on the other side of the European long-distance hiking trail. Its symbolic meaning is: healthy boundaries. We do not set walls between us humans and we do not tear down any fences. Rather, we are aware of the fences and recognize the light and beauty they protect. Freedom does not mean "No nation, no border". Freedom comes from within: we are aware of the inner "ideological fences" that separate us from each other; and from truth and life. Border Stone - Here you will find a detailed reflection on the two sides of the large stone from Odenwald quartz: the raw side with the suffering and the burden of the past and the smoothed, civilized side with "Yerushalayim" as a root of our culture and as a reference to the "heavenly Jerusalem", symbol of freedom and hope for peace in the world. View onto the Rhine Plane, where once was Jerusalem on the Rhine. If you look from the Rose of Shalom to the west, between the two hills, the silhouette of the city of Worms (22 km) can be seen with its huge cathedral on the horizon. Worms is the geographical middle of the three cities Speyer, Worms and Mainz, who formed in the high Middle Ages Jerusalem on the Rhine. Because of their vital importance for the Jewish congregations in Central Europe, they are considered the birthplace of the Ashkenazi Jewish culture. Jerusalem on the Rhein - Here you'll find more information about this Jewish history. The Rose of Shalom is a sign for Shalom, which means harmony, salvation, wealth, and peace. The Jewish poet Nelly Sachs described Shalom as „a butterfly zone of dreams“. Shalom begins in one's own soul. The Rose of Shalom consists of the flower of a „White Rose“ with a star resting on it: A living heart! The hexagonal star symbolizes the connection between "Heaven" and "Earth", between spirit and matter. The Rose is located in the center of the Tree of Life within the Circle of Peace: man can connect "heaven" and "earth" inside himself, similar to a tree. The Rose of Shalom - Here you can find pictures and texts of the inauguration of the white Rose of Shalom on May 17, 2012. The placing of the "Chai" - overcoming the "Terror of Loneliness"
The German past left deep traces in the souls of the descendants. Traumas were inherited from the parents and little attention was paid to the late effects of the Second World War that are described here. With the culture of remembrance, the topics Holocaust and German war guilt were taught intensively. This shook the sense of own identity painfully. The German admonishing culture focused on past and guilt, and the future with the hope of new life was missing. As a result, many people closed the mind for this topic or they got stuck in the pain of the past. Both could not help a necessary cure, but destroyed relationship; first the relationship to oneself. What has been learned from the past that leads us into the future? How about the insight that our freedom is lost without a constant struggle for it? Appreciating freedom, that is much more the impression one has, does not correspond to the German mentality. Anxiety deeply rooted in the soul makes people rather want to be in the safety of a herd with the proper ideology; it's still like that. But that is precisely why Germany today is eroding, which we knew as a safe country. So did we Germans only turn around in a circle instead of having a real insight? The past is part of oneself. The past can become repressed, held on to it, or it can be accepted in love so that a wound heals in the new understanding. 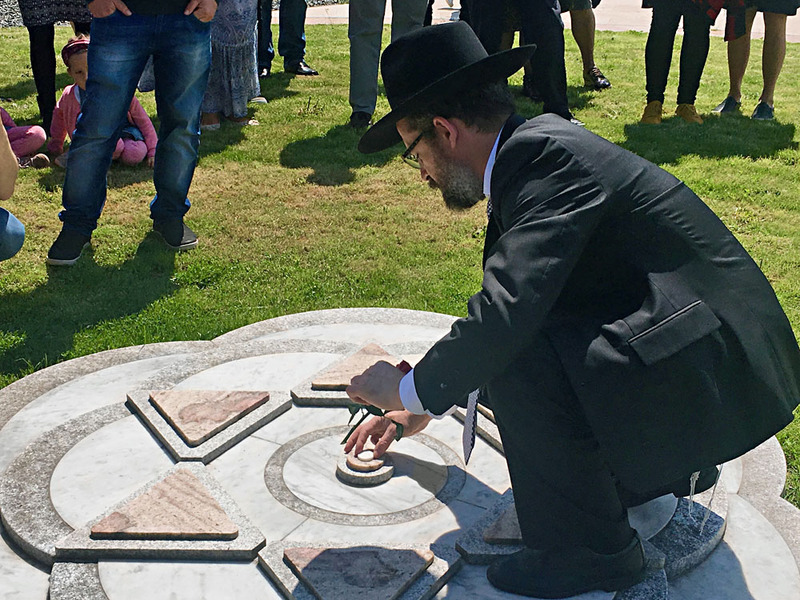 Remembering is not enough: As a symbol for life Rabbi Mordechai Mendelson sets the Turning Point with the inscription "Chai" (Life). Peace for the individual: One perceives the pain, grief, fear and anger caused by the memories and walks a path of peace with them. It is not peace with injustice, but it means that one no longer runs away from these feelings; they become embraced in love and in a hope of new life. Making relationship: In the "Circle of Peace" one can then "embrace" others as well. In deep encounters with fellow human beings, the "Terror of Loneliness" programmed into our society can be overcome. Society needs cohesion rather than division. "Circle of Peace" means "to refuse cooperation with madness" (Rubikon). The Turning Point with the inscription "Chai", Hebrew for "life", had been placed on May 14, 2017 (Jewish calendar: 9 (Iyar), 18, 5777). From this one point, the whole monument has been measured and constructed.